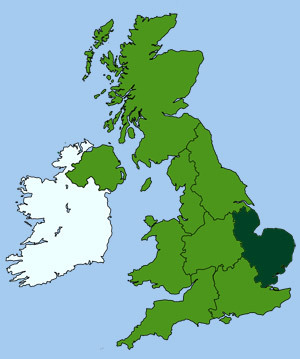 The East of England (part of which forms ancient East Anglia) contains two distinct landscapes. One is of open flat fens ribboned by waterways and meres, dotted with old wind mills, the other is rich with gentle hills and villages of stone and flint cottages. The coastline is buffeted by the North sea to form long soft beaches and salt marshes that support a plethora of native and migrating birds. Much of this coastline is slowly being erroded by the elements.